When Kevin Rowland was living in Sussex in the 1990s, it was perhaps not the best of times for him. To say it was the worst of times is to make a judgement on recreational cross-dressing and cocaine use; but if we judge Rowland purely on the genius of his musical output then his barren sojourn in Brighton must rank as a low. 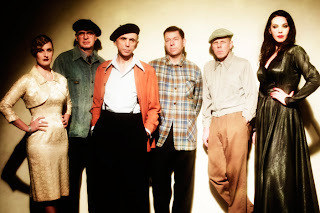 Returning to the city this week with Dexys, now shorn of their nocturnal athleticism, to treat an audience at the Dome to new album, ‘One Day I‘m Going To Soar’, must have been anticipated by him with something of a bitter sweetness. Dexys Midnight Runners’ three albums from the first half of the 1980s are the stuff of legend: the brassy stomp of ‘Searching for the Young Soul Rebels’, the Celtic soul of ‘Too-Rye-Ay’ and the complex and misunderstood ‘Don’t Stand Me Down’. To release an album 27 years after your last, that is of such boldness, beauty and brilliance only adds to the legend. Stax and Philly-tinged, with Rowland’s strong, stylised voice same as it ever was, and complete with the usual curious vocal tics (“Now, now, now, now, now), the album is incredible. With Pete Williams and Mick Talbot back from the very first album and ever-present Big Jim Paterson, the band is tight and soulful with the drums high up in the mix of an uncluttered “live” sound. With plenty of spoken-word sections and call and response vocals between Rowland and Williams and Madeleine Hyland, the album drifts to the very brink of musical theatre. One of my mates thinks that ‘One Day I‘m Going To Soar’ is “possibly the greatest album ever made”. Strong stuff, but he knows a thing or two about music. What makes it great, he says, is that they mean it despite the fact that they perhaps should not. Failure to make the recent Mercury prize shortlist seems puzzling. It was well trailed that Dexys’ performance on their current tour would consist of the new album played in its entirety, and in order, followed by a set of classics. This does not prevent a little restlessness from a tiny minority in the audience who have come to hear the hits. But mostly there is a hushed respect and restrained applause as the band go through the album. The songs sound even better live: the vocals soar and the band is inspired. Lucy Morgan’s viola and Big Jim’s trombone combine perfectly to create the wistful power of Dexys’ sound. The conceptual nature of the album comes across with even greater clarity live as Rowland sings to images of Hyland projected on a screen in the build up to their duets on ‘I’m Always Going To Love You’ And ‘Incapable of Love’. When Hyland appears on stage to deliver her powerful vocal performance, her dress alone should walk away with the Mercury prize. And the rest of the band are all sartorial elegance with their Speakeasy/On the Waterfront retro stylings. Rowland starts off in a chalk-stripe zoot suit and fedora, later shedding the jacket to reveal a shirt, the likes of which have not been seen on stage since Kid Creole and the Coconuts. When the reprise of ‘Free’ finishes off the album and the first set, the audience explodes from its reverence into a wild standing ovation. Rowland is visibly moved, thumping his heart with his fist and declaring over and over “this means a lot” and adding “especially in Brighton”. The band then run through a selection of earlier songs containing only one hit single, a reworking of ‘Come On Eileen’. I think this is a beautiful song but it is almost impossible to extricate critically from its status as wedding reception floor-filler in succession to ‘Hi Ho Silver Lining’. What made the second set so pleasurable, apart from the bizarre role play with Williams as a policeman, was the selection of less well known songs that were clearly strong audience favourites. Tracks such as ‘Tell Me When My Light Turns Green’, ‘Liars A to E’ – my personal favourite – and the mighty ‘This Is What She’s Like’ were met with waves of approval and, when Dexys left the stage after more than two hours, the audience were emotionally spent. Whether this was the greatest gig I have ever been to, I am not sure, but what I do know is, it was amongst the very best of times.